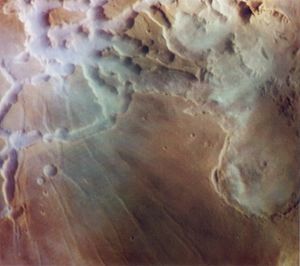 Valles Marineris stretches over 4,000 km (2,500 mi) across Mars, mostly east-west just below the equator, as seen in this Viking 1 orbiter image mosaic. 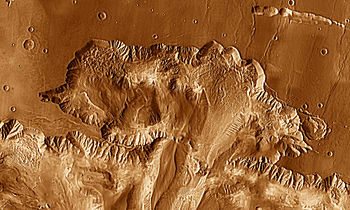 The three Tharsis Montes are at left; towards the top, an ancient outflow channel stretches northward from Echus Chasma to Kasei Valles. Similar outflow channels extend from the east end of Valles Marineris towards Mars's northern lowlands. 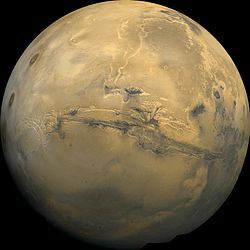 Valles Marineris is located along the equator of Mars, on the east side of the Tharsis Bulge, and stretches for nearly a quarter of the planet's circumference. 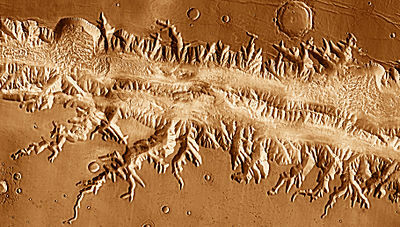 The canyon system starts in the west with Noctis Labyrinthus; proceeding to the east are Tithonium and Ius chasmata, then Melas, Candor and Ophir chasmata, then Coprates Chasma, then Ganges, Capri and Eos chasmata; finally it empties into an outflow channel region containing chaotic terrain that ends in the basin of Chryse Planitia. It has been recently suggested that Valles Marineris is a large tectonic "crack" in the Martian crust. Most researchers agree that this formed as the crust thickened in the Tharsis region to the west, and was subsequently widened by erosion. Near the eastern flanks of the rift, there appear to be channels that may have been formed by water or carbon dioxide. It has also been proposed that Valles Marineris is a large channel formed by the erosion of lava flowing from the flank of Pavonis Mons. There have been many different theories about the formation of Valles Marineris that have changed over the years. Ideas in the 1970s were erosion by water or thermokarst activity, which is the melting of permafrost in glacial climes. Thermokarst activity may contribute, but erosion by water is a problematic mechanism because liquid water cannot exist in most current Martian surface conditions, which typically experience about 1% of Earth's atmospheric pressure and a temperature range of 148 K (−125 °C; −193 °F) to 310 K (37 °C; 98 °F). Many scientists agree that there was liquid water flowing on the Martian surface in the past. Valles Marineris may have been enlarged by flowing water at this time. Another hypothesis by McCauley in 1972 was that the canyons formed by withdrawal of subsurface magma. Around 1989 Tanaka and Golombek proposed a theory of formation by tensional fracturing. 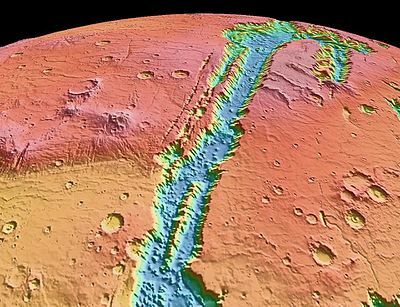 The most agreed upon theory today is that Valles Marineris was formed by rift faults like the East African Rift, later made bigger by erosion and collapsing of the rift walls. It has also been proposed that Valles Marineris was formed by flowing lava. Landslides have left numerous deposits on the floor of Valles Marineris and contributed to widening it. Possible triggers of landslides are quakes caused by tectonic activity or impact events. Both types of events release seismic waves that accelerate the ground at and below the surface. Mars is much less tectonically active than Earth, and Mars-quakes are unlikely to have provided seismic waves of the required magnitude. Most sizable craters on Mars date to the Late Heavy Bombardment, 4.1 to 3.8 billion years ago (the Noachian period), and are older than the landslide deposits in Valles Marineris. However, three craters (including the crater Oudemans) have been identified, on the basis of their proximity and later dates, as ones whose formation may have caused some of the landslides. Valles Marineris with major features labeled. Noctis Labyrinthus, on the western edge of the Valles Marineris Rift System, north of the Syria Planum and east of Pavonis Mons, is a jumbled terrain composed of huge blocks which are heavily fractured. Also it contains canyons that run in different directions surrounding large blocks of older terrain. Most of the upper parts of the blocks are composed of younger fractured material thought to be of volcanic origin associated with the Tharsis bulge. The other tops are composed of older fractured material thought also to be volcanic in origin, but differentiated from the younger material by more ruggedness and more impact craters. The sides of the blocks are composed of undivided material thought to be basement rock. The space between the blocks is composed mainly of either rough or smooth floor material. The rough floor material tends to be in the eastern portion of the Noctis Labyrinthus and is thought to be debris from the walls or maybe eolian features covering rough topography and landslides. The smooth floor material is thought to be composed of fluvial or basaltic material and/or eolian features covering an otherwise rough and jumbled terrain. Terrains such as Noctis Labyrinthus are commonly found at the head of outflow channels, like the one explored by the Pathfinder mission and its Sojourner rover. They are interpreted to be a place of downward block faulting associated with the removal of ground fluid in catastrophic flood sequences. The fluid could be either carbon-dioxide ice and gas, water or lava. The hypothesis of lava involvement is associated with a proposal that Noctis Labyrinthus is directly connected to lava tubes on the slope of Pavonis Mons. Part of Noctis Labyrinthus taken with Mars Global Surveyor. Layers in the wall of Noctis Labyrinthus taken with Mars Global Surveyor, under the MOC Public Targeting Program. Section of layers near top of Noctis Labyrinthus, as seen by HiRISE under the HiWish program. Group of layers near the bottom of Noctis Labyrinthus, as seen by HiRISE under the HiWish program. Close-up of part of previous image of layers in Noctis Labyrinthus, as seen by HiRISE under the HiWish program. Close-up of complex, dark dunes in the previous image of the floor of Noctis Labyrinthus, as seen by HiRISE under the HiWish program. Close-up of some layers in wall of Noctis Labyrinthus, as seen by HiRISE under the HiWish program. Ius Chasma image mosaic from 2001 Mars Odyssey, showing side canyons created by sapping. On the northern (upper) rim, right of center, a side canyon turns 90 degrees where it encounters a graben. Further to the east from Oudemans, Ius and Tithonium chasmata are located parallel to each other, Ius to the south and Tithonium to the north. Ius is the wider of the two, leading to Melas Chasma. Ius has a ridge down the center of it by the name of Geryon Montes, composed of the undivided basement rock. The floor of Ius Chasma is mostly composed of pristine landslide material, not much degraded by cratering or erosion. The southern wall of Ius, and to a lesser extent the northern wall, has many short valleys stretching off roughly perpendicular to the line of the chasmas. These valleys have a stubby theater-headed leading edge very much like features seen on the Colorado Plateau near the Grand Canyon that appear from groundwater sapping. (Theater-headed means that, from above, the head of the valley is a well-defined U-shape). The valley is propagated by the continued erosion and the collapse of the wall. Tithonium Chasma is very similar to Ius, except it is lacking the sapping features on the south side and contains a small portion of material that is similar to the smooth floor features except that it appears to be an ash fall that has been eroded by the wind. 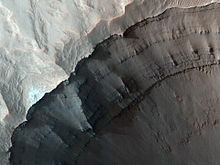 Between the two canyons, the surface is composed of younger fractured material - lava flows and faults from crustal extension of the Tharsis Bulge. 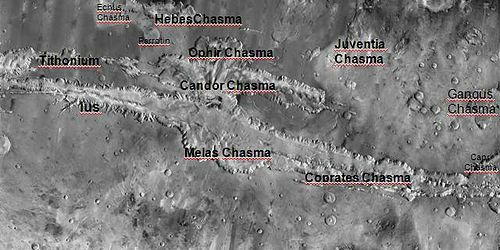 The next portion of Valles Marineris to the east are three chasmata, that from south to north are Melas, Candor and Ophir chasmata. Melas is east of Ius, Candor is east of Tithonium and Ophir appears as an oval that runs into Candor. All three chasmata are connected. The floor of Melas Chasma is about 70% younger massive material that is thought to be volcanic ash whipped up by the wind into eolian features. It also contains rough floor material from the erosion of the canyon walls. Also, in these central chasmata there is a portion of the floor that is higher than the rest of the floor, most likely left by the continued dropping of the other floor material. Around the edges of Melas is also a lot of slide material as seen in Ius and Tithonium chasmata. 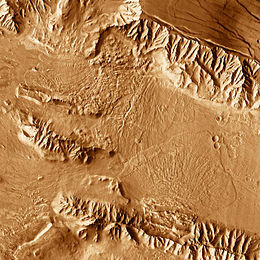 This is also the deepest part of the Valles Marineris system at 11 km (36,000 ft) below the surrounding surface; from here the outflow channels are about a 0.03 degree slope upward to the northern plains, which means that if you filled the canyon with fluid, it would be a lake with a depth of 1 km (3,300 ft) before the fluid would flow out onto the northern plains. The material of the floor of the canyon system between Candor and Melas chasmata is grooved. This is interpreted to be alluvial deposits and/or material that has collapsed or contracted by the removal of ice or water. There are also portions of older and younger massive floor material of volcaniclastic origin - only separated in age by crater distribution. Also there is etched massive floor material that is like the younger and older massive material except that it has wind erosion features on it. There are also a few spires of undivided material composed of the same material as the canyon walls. Seasonal flows on Coprates Chasma in Valles Marineris. Deposits from landslides moving in opposite directions meet on the canyon floor near the junction of Melas and Coprates chasmata. Further to the east, the canyon system runs into Coprates Chasma, which is very similar to Ius and Tithonium chasmata. Coprates differs from Ius in the eastern end which contains alluvial deposits and eolian material and like Ius, has layered deposits, although the deposits in the Coprates Chasma are much more well defined. These deposits pre-date the Valles Marineris system, suggesting erosion and sedimentary processes later cut by the Valles Marineris system. 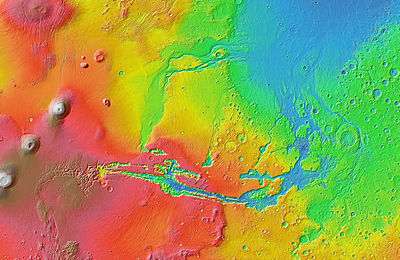 Newer data from Mars Global Surveyor suggest that the origin of this layering is either just a succession of landslides, one over another, volcanic in origin, or it may be the bottom of a basin of either liquid or solid water ice suggesting that the peripheral canyons of the Valles Marineris system could have been at one time isolated lakes formed from erosional collapse. Another possible source of the layered deposits could be wind-blown, but the diversity of the layers suggests that this material is not dominant. Note that only the upper layers are thin, while the bottom layers are very big, suggesting that the lower layers were composed of mass wasted rock and the upper layers come from another source. Some of this layering may have been transferred to the floor by landslides in which the layers are kept semi-intact, yet the layered section looks highly deformed with thickening and thinning beds that have multitudes of folds in them as seen in MOC image #8405. This complex terrain could also be just eroded sediment from an ancient Martian lake-bed and appear complex because all that we have is an aerial view like a geologic map and not enough elevation data to see if the beds are horizontal. A field of more than 100 pitted cones on the floor of Coprates Chasma has been interpreted as a set of small igneous cinder or tuff cones, with associated lava flows. Crater dating indicates they are of Middle to Late Amazonian age, about 200 to 400 million years old. Further to the east lie Eos and Ganges chasmata. 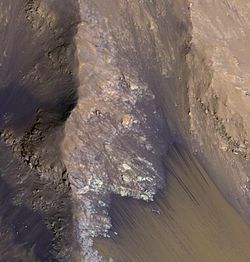 Eos Chasma's western floor is mainly composed of an etched massive material composed of either volcanic or eolian deposits later eroded by the Martian wind. The eastern end of the Eos chasma has a large area of streamlined bars and longitudinal striations. This is interpreted to be stream-carved plateau deposits and material transported and deposited by flowing fluid. Gangis Chasma is an offshoot chasma of Eos in a general east-west trend. The floor of Gangis is mainly composed of alluvial deposits from the canyon walls. East of Eos and Ganges, Valles Marineris empties out into the Chryse region of the northern plains of Mars at an elevation only 1 km (3,300 ft) above the deepest point of Valles Marineris in Melas Chasma. The outflow regions of the northern plains are similar to the terrain seen at the Mars Pathfinder landing site. A terrestrial counterpart of these outflow channels on Earth would be the scablands of eastern Washington. The eastern Washington scablands are a result of repeated catastrophic flooding due to the build-up of an ice dam at the head of Lake Missoula in the Late Pleistocene. The ice dam would block the water for a while, but when it broke, the ice would float on top of the ensuing flood and vast areas would be stripped of topsoil and vegetation, leaving a large barren area of 'teardrop' islands, longitudinal grooves and terraced margins. Many of these features are also seen in Martian outflow channels, but on a larger scale. The outflow occurs successively through several regions of chaotic terrain, Aurorae Chaos and Hydraotes Chaos, and finally through Simud Valles and Tiu Valles into Chryse Planitia. ^ "Vallis Marineris". Goddard Space Flight Center. NASA. 2002. Archived from the original on 2007-07-11. Retrieved 2018-01-22. ^ "Valles Marineris". Welcome to the Planets. NASA. 2005. Retrieved 2018-01-22. ^ Wolpert, Stuart (2012-08-09). "UCLA scientist discovers plate tectonics on Mars". UCLA. Retrieved 2012-08-13. ^ Lin, An (2012-06-04). "Structural analysis of the Valles Marineris fault zone: Possible evidence for large-scale strike-slip faulting on Mars". Lithosphere. 4 (4): 286–330. Bibcode:2012Lsphe...4..286Y. doi:10.1130/L192.1. Retrieved 2012-10-02. ^ a b Leone, Giovanni (2014-05-01). 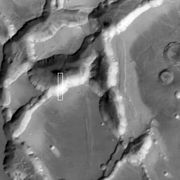 "A network of lava tubes as the origin of Labyrinthus Noctis and Valles Marineris on Mars". Journal of Volcanology and Geothermal Research. 277: 1–8. Bibcode:2014JVGR..277....1L. doi:10.1016/j.jvolgeores.2014.01.011. ^ a b Akers, C.; Schedl, A. D.; Mundy, L. (2012). "What Caused the Landslides in Valles Marineris, Mars?" (PDF). 43rd Lunar and Planetary Science Conference. p. 1932. Retrieved 2013-02-11. ^ a b c d e f Witbeck, Tanaka and Scott, Geologic Map of the Valles Marineris Region, Mars; USGS I-2010; 1991. ^ a b Rodriguez, J. Alexis P.; Kargel, Jeffrey S.; Baker, Victor R.; Gulick, Virginia C.; et al. (8 September 2015). "Martian outflow channels: How did their source aquifers form, and why did they drain so rapidly?". Scientific Reports. 5: 13404. Bibcode:2015NatSR...513404R. doi:10.1038/srep13404. PMC 4562069. PMID 26346067. Retrieved 2015-09-12. ^ Howard, Kochel and Holt; Sapping Features of the Colorado Plateau: A Comparative Planetary Geology Field Guide; NASA; 1988. ^ "Recent volcanic activity and hydrothermal minerals on Mars". Czech Academy of Sciences. 2017-07-19. Retrieved 2017-07-27. ^ Brož, P.; Hauber, E.; Wray, J. J.; Michael, G. (2017). "Amazonian volcanism inside Valles Marineris on Mars". Earth and Planetary Science Letters. 473: 122–130. Bibcode:2017E&PSL.473..122B. doi:10.1016/j.epsl.2017.06.003. Computer Simulation of a flyby through Mariner Valley on "Maniac World"